July 17, 2008 in "Design"
This is an ad that I did for the July issue of Total Telecom Magazine. 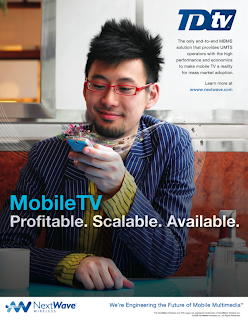 It highlights the NextWave Wireless Mobile TV technology, TDtv. Without getting into all the technical jargon, TDtv basically allows for 28 high-quality TV stations to be viewed live on your phone. Over in the UK, Orange and T-Mobile will be performing a pilot of the technology in the next few months, and from there, hopefully it will be opened to all their customers.